Today, scaffolding surrounds the Consolidated Building at 115 North Pennsylvania Street in downtown Indianapolis as TWG Development, LLC restores the 1910 high-rise into apartments and retail space. But did you know that long before the last tenants, Downtown Comics, moved out of the R. P. Daggett & Co. designed building in 2000, its front doors once led the way to a theater that featured Indy’s first peek at a moving picture? On September 13th, 1875, on ground that once was the location of a wooden shack housing a fur, hide and produce store, Park Theater owners Dickson & Talbott opened the Grand Opera House. 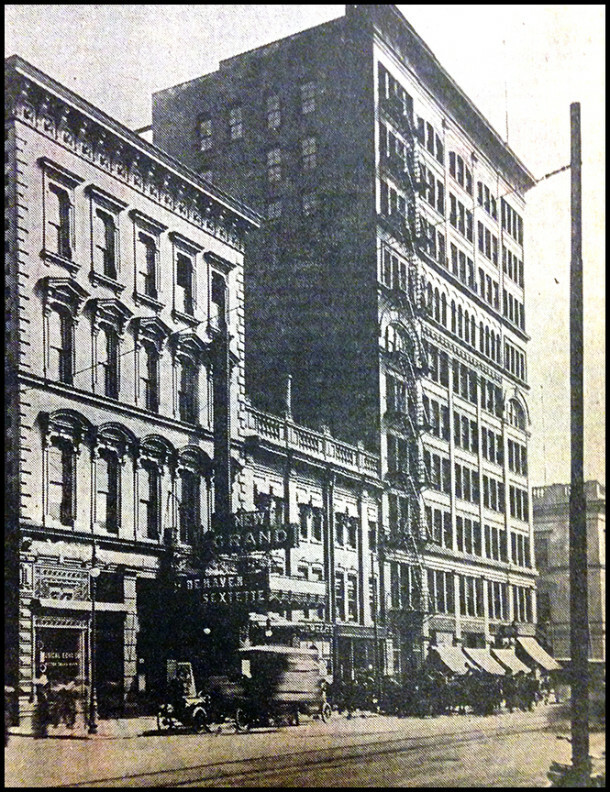 The Grand was Indianapolis’ preeminent locale for both “serious” theater and variety acts until the 1880 opening of the English Opera House & Hotel a few blocks away on the circle. According to an August, 1964 article covering the closing of the theater, control of The Grand was passed to Vaudevillian promoters Anderson & Ziegler in 1901 and then to Vaudevillian magnate B.F. Keith soon after. 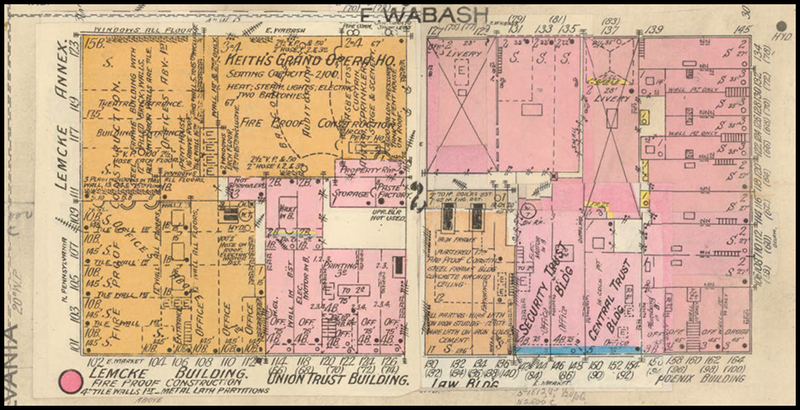 However, Keith and Co. had to have taken over control at least three years prior, as the theater is clearly listed as Keith’s Grand Opera House in the above portion of the 1898 Sandborn Insurance Map of Indianapolis. B.F. Keith cut his theatrical teeth touring with the Forepaugh Circus. The aforementioned Benjamin Franklin Keith, a New Hampshire native born January 26, 1846, indeed ran away and joined the circus as a young man. 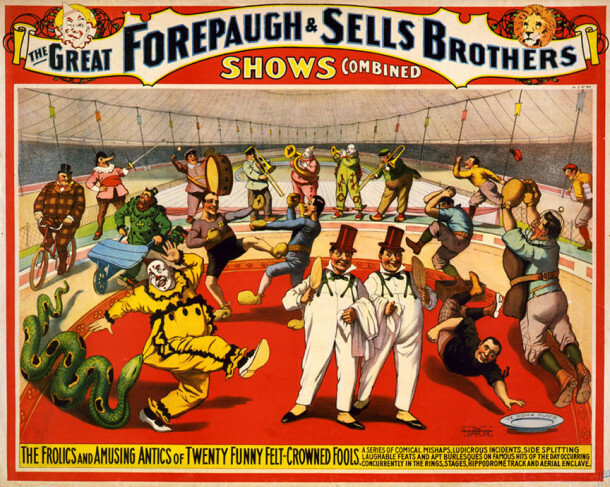 Inspired by the touring “Van Amburg’s Circus“, a circus company that bore the name of its founder and the world’s first “lion-tamer”, Isaac Van Amburg, Keith joined the Forepaugh Circus, worked for P.T. Barnum protege George Bunnell’s curiosity museum in New York, and then worked for Barnum himself before opening his own dime museum in Boston in 1883. 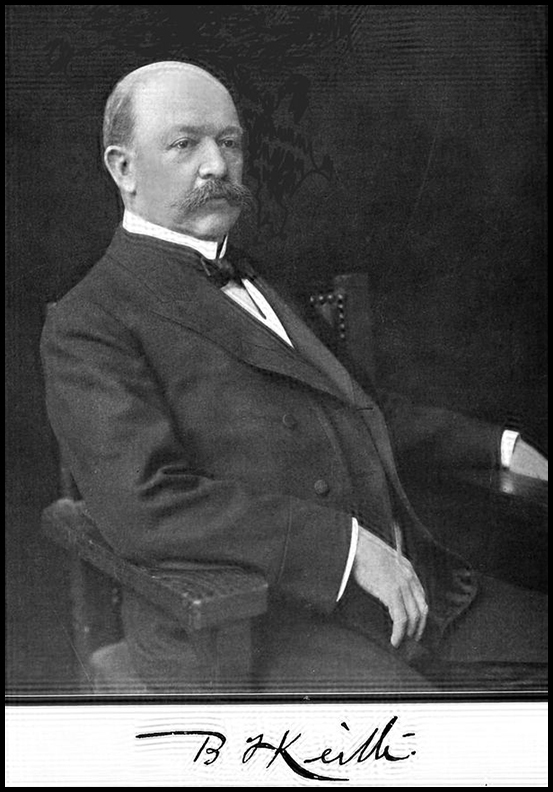 Vaudeville pioneer Benjamin Franklin Keith circa 1909. Keith teamed up with fellow circus promoter, Edward Franklin Albee II to take over Boston’s Bijou Theater in 1885. As Antebellum America’s appetite for the Vaudevillian variety show exploded and the novelty of the movie picture gained interest, the two built or took over theaters in New York, Philadelphia and all over the Midwest, including the Grand Opera House in Indianapolis. 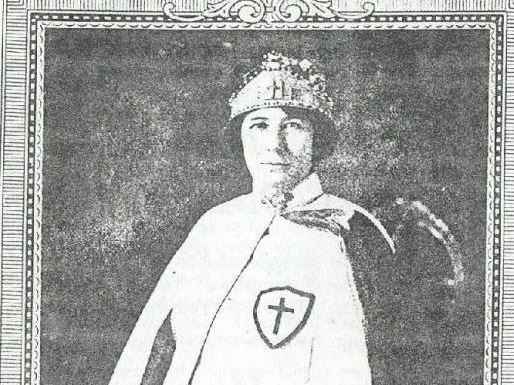 After Keith’s death in 1914, their company, by then very invested in the burgeoning motion picture industry, merged with a rival circuit of theaters know as the Orpheum. This newly merged conglomerate originally went by the Keith-Albee-Orpheum Co. but a few months later was renamed, the more memorable Radio-Keith-Orpheum (or RKO) Motion Picture Studios. In 1910, the series of small buildings that lined Pennsylvania Street were razed to make room for the 15 story Lemcke Annex (later the Consolidated Building) that was built adjacent to the existing (and now non-existing) Lemcke Building at the northeast corner of Market and Pennsylvania Streets, and owned by local business man Ralph A. Lemcke, who would later lose as an anti-Klan candidate in the 1925 Republican Mayoral primary to the Ku Klux Klan supported John Duvall. Left: Harry Houdini poses before a Pluto Spring billboard in Indianapolis. (Upland Brewery fans should note the Champagne Velvet sign). Right: Houdini’s poster advertising his 1910 appearance at B. F. Keith’s Theater. 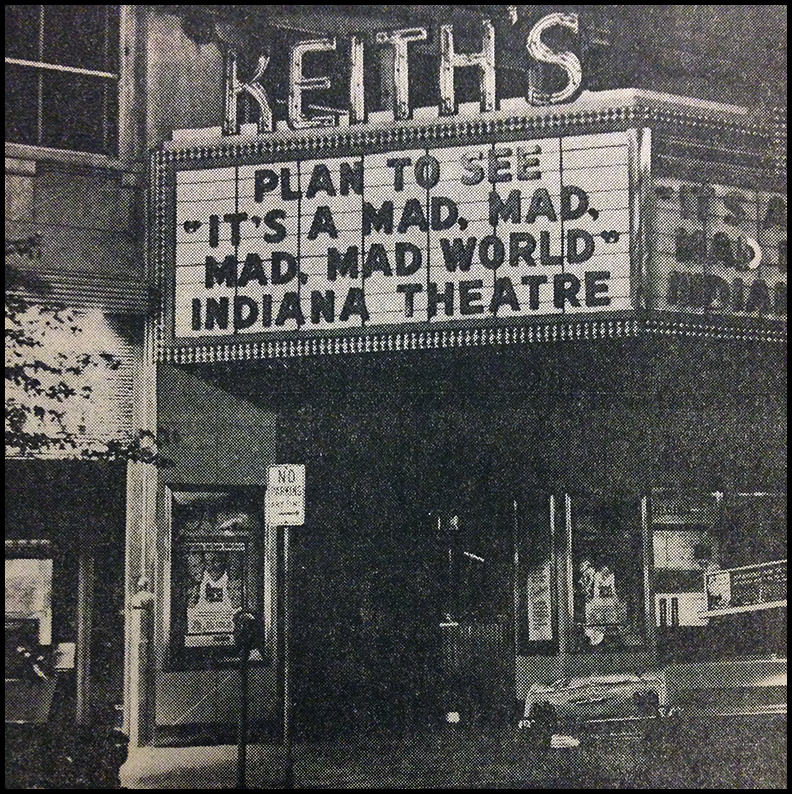 Keith’s Theater entertained Indianapolis through the first three decades of the 20th century with a combination of theater, motion pictures and variety acts, including at least one engagement by famed magician and escape artist Harry Houdini, who tailored his act to Indianapolis’ heavily Germanic population by escaping from a tub of beer provided by the Indianapolis Brewing Co. The Depression hit the entertainment industry hard as Americans struggled to feed themselves, let alone come up with the means to purchase entertainment, and Keith’s had to tighten the belt as well, offering shows at rock-bottom prices. In 1936, the theater was occupied by the New Deal funded Federal Players who produced 33 plays in their first and only season. Keith’s continued to struggle into the ’40s even after the addition of the air conditioning that theater goers had grown accustomed to and now required. In the few years immediately after the end of World War II, the theater returned to its Vaudevillian roots, offering variety acts including the likes of Blackstone the Magician. However, with old theaters around downtown became increasingly difficult to fill with the dawning of the television age, Keith’s permanently closed in 1964 and it was announced the aging opera house would be destroyed. Confusion arose with said announcement, as many in the community didn’t distinguish the theater from its Consolidated Building entrance. But the Consolidated was spared the fate of Keith’s, whose owners had arranged the razing of the theater to expand in its own right. While the Keith’s Opera House is on the long list of ornate movie houses that no longer grace the Mile Square, at least we are fortunate to not lose the high-rise that sealed its fate. I think your description of the billboard behind Harry Houdini is incorrect. 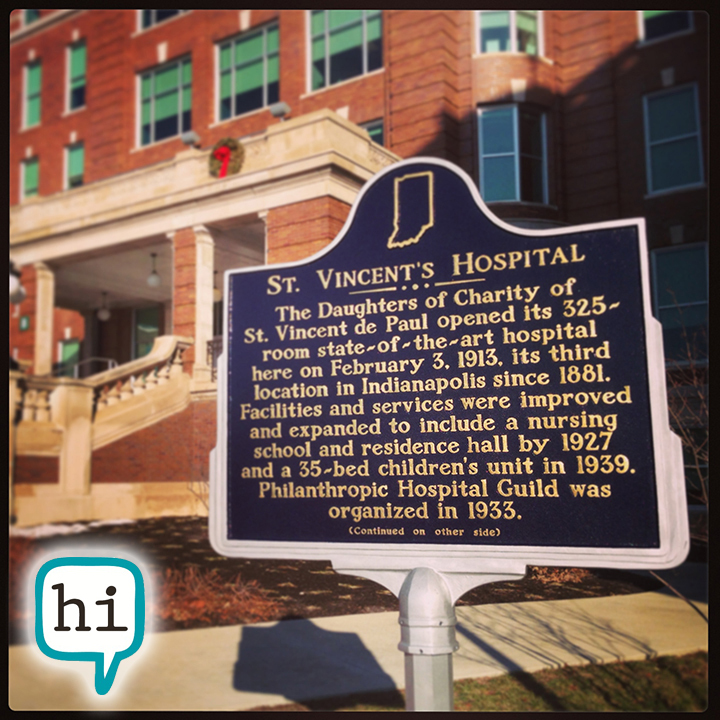 It advertises the French Lick Springs Hotel that was owned by Thomas Taggart (former mayor of Indianapolis). The billboard mentions the Pluto Spring (water the family bottled). 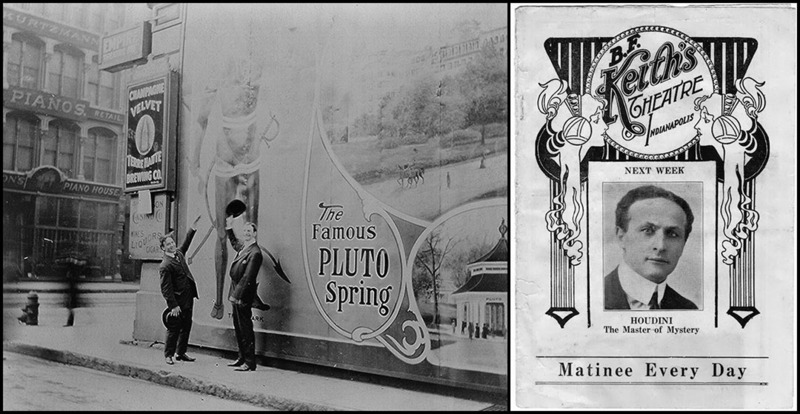 The figure behind Houdini appears to be Pluto, mascot of the hotel and spring. Caption fixed and thank you for the assist! Back about 1946 I saw Blackstone the Magician on the stage of the Keith Theatre. And it was never simply Blackstone, always Blackstone the Magician, even in the comic books with his name. The only magic of that performance I recall was The Man pulling an electric cord on stage, twisting a switch, and having a rather dim standard-sized light bulb come on. Then he proceeded to unscrew the light bulb, which stayed lit! He handed it to his scantily clad assistant (which was pretty racy for a 14-year-old country boy), and she walked off stage with the bulb still lit. Unfortunately, I don’t recall the other acts on the bill, but if it was a traditional vaudeville show, there was probably a trained dog act, a comedian, a juggler and a couple of acrobats. However, Blackstone the Magician was a big enough draw that he may have performed by himself. The last time I checked (about ten years ago), the opera house was still standing. However, it had been converted to a parking garage. 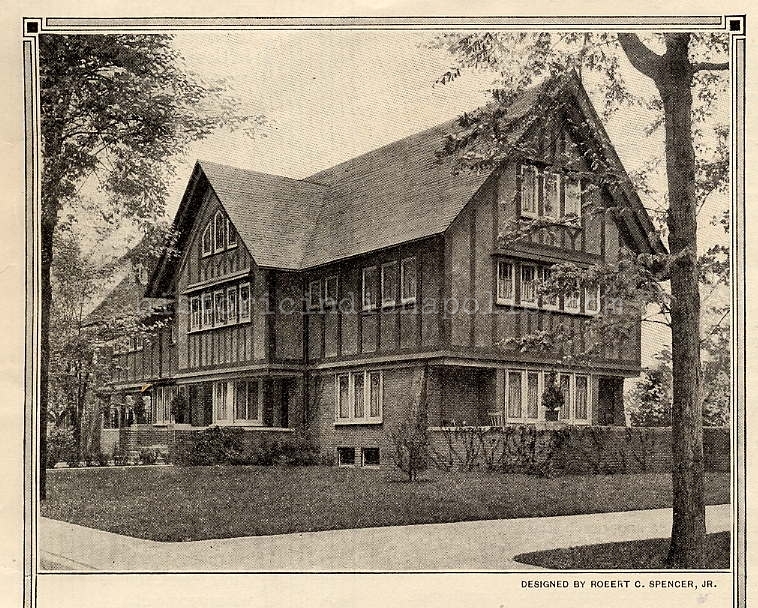 A similar fate befell a grand movie palace in Detroit. David, I believe you’re thinking of the Empire Theater, just across Wabash Street from where Keith’s used to be. 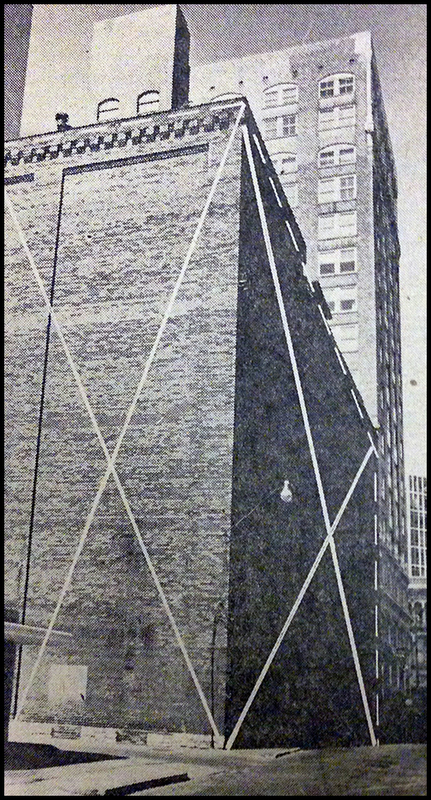 My aunt parked there when she worked for Indiana Insurance (in the Consolidated Building) for over 50 years (although her last few years were at the insurance company’s new building on 96th St. The area where Keith’s was located was a surface parking lot. I used to work in the Consolidated Building in the late 1980s when Indiana Insurance occupied several floors of it (and the building built behind it after the Keith Theater was demolished). I remember how odd I thought the first floor entrance- it sloped upward toward some rather nice elevators. I recall someone telling me it had formerly been the entrance to the Keith. It was hard for me to picture, but now I see how it worked thanks to your explanation and pictures. 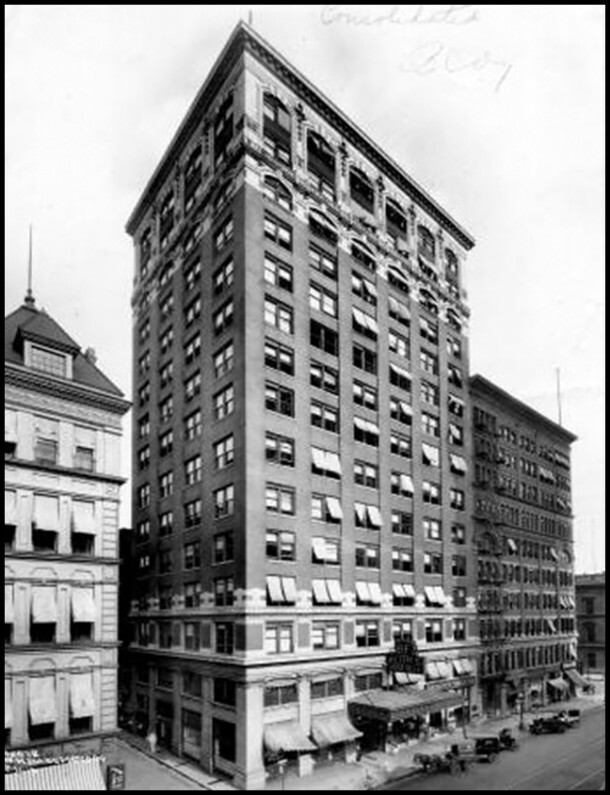 The Consolidated Building wasn’t in good shape in the 80s and went downhill quickly after Indiana moved to its new building on East 96th Street in the early 1990s. I heard there were out-of-town landlords who couldn’t afford to do the total refurbishment needed. I lamented the fact that it was one of the few buildings downtown that stood vacant and in disrepair while things around it were updated. A tiny bar named The Cozy was located at a side entrance to this building- I have no idea how long that was located there, but know it moved across the street and south a block at one point (may still be there). The handy nature of The Cozy contributed to the downfall (and alcoholism) of more than one insurance person in the old days, that was for sure! I’m not sure if you are accessing this on a mobile site, but as you scroll down, the flare buttons should pop up on the left. We will be changing them soon, but please know, they are there! I also worked in the Consolidated Building for a doctor from 1973 to 1980, when he retired. His office moved there from the Hume-Mansur Building since it was being demolished for the Bank One Tower. His office was located on the 15th floor (1542? ), where the far right top two windows are located in the picture. Remember The Cozy Bar – the office gang would go there occasionally for birthday lunches. There was a Burger Chef located across the alley/street, where I ate many lunches. Parked my car on the roof (cheaper monthly rate) of the old Denison’s garage. Watched a few 500 Festival Parades from those windows. 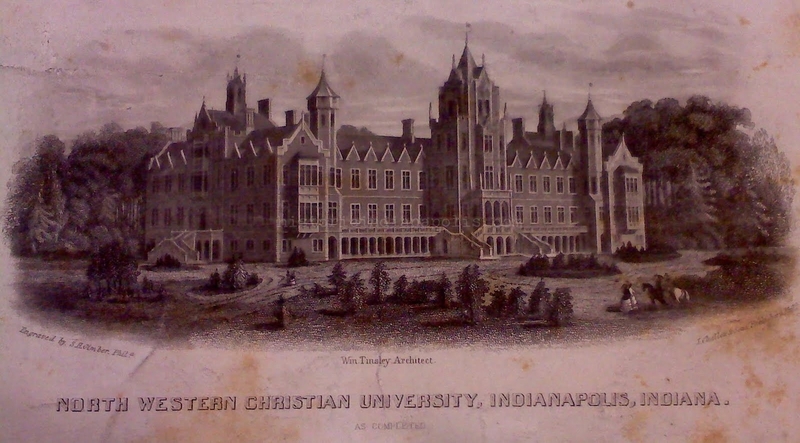 Back then, the Consolidated Building was very nice. Good times and memories!